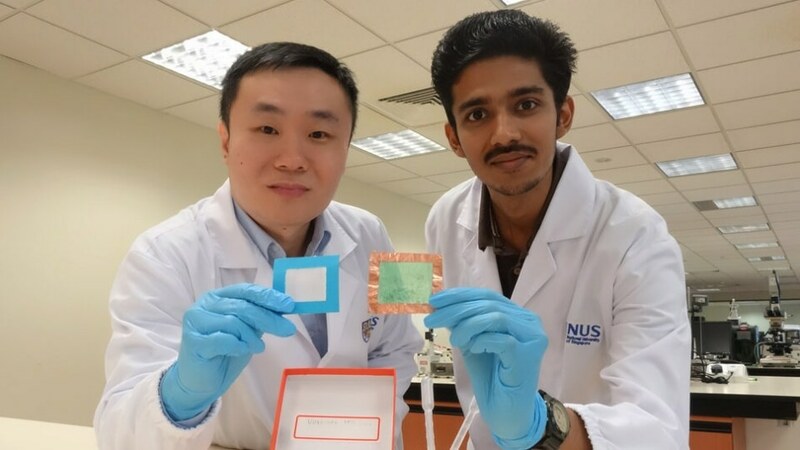 Researchers from the National University of Singapore (NUS) have successfully developed a unique nanofiber solution that forms thin, see-through air filters that can eliminate nearly 90 % of PM2.5 particles and realize high air flow of 2.5 times better than traditional air filters. Additionally, this eco-friendly air filter enhances natural lighting and visibility while blocking destructive UV rays. Air filters built using this novel nanofiber solution are twice as better in quality than commercial ones, and are ideal for applications on doors and windows to enhance indoor air quality. This novel air filter can potentially also be used in respirators. The air filter is easy to produce as well as eco-friendly. By applying the novel nanofiber solution onto a non-woven mesh and then allowing it to dry naturally, the air filter is ready. Using phthalocyanine, a chemical compound typically used in dyeing, the NUS team created organic molecules that were capable of self-organizing, just like the stacking of building blocks, to form nanoparticles and consequently, nanofibers. These nanofibers, which occur in the form of an organic solution, easily "cling" onto the non-woven mesh when scattered onto the material. Air pollution poses serious health threats. Therefore, there is a strong need for economical and effective technologies for air filtration. Currently, most nanofibres used in air filters are energy intensive to produce and require specialised equipment. Our team has developed a simple, quick and cost-effective way of producing high-quality air filters that effectively remove harmful particles and further improves indoor air quality by enhancing air ventilation and reducing harmful UV rays. In the long run, it may even be possible for a DIY (do-it-yourself) kit to be made available commercially for consumers to make air filters at home. The NUS team also consisted of Mr Sai Kishore Ravi from the NUS Department of Materials Science and Engineering, and Dr Varun Kumar Singh, who was previously with the Department. The research findings were recently published in the online version of scientific journal, Small. Air-filters are usually gaged by a parameter known as quality factor, which relies on two sub-factors, air permeability and particle filtration efficiency. Currently, while commercial respirators have a high particle filtration efficiency, air permeability is still significantly low, thus causing in a low quality factor. The team’s air filter accomplishes a quality factor of approximately two times higher than commercial respirators. It can filter up to 90 % of harmful particles that are below 2.5 μm in size – also referred as PM2.5 particles and linked with serious health threats – while sustaining air flow that is 2.5 times better than commercial respirators, resulting in improved breathability. In fact, the particle filtration efficiency can also be additionally improved, depending on the functionality and purpose of the air filter. High-efficiency air filters often require multiple layers of microfibres or nanofibres, thus limiting their transparency and as such, they are not suitable to be incorporated in doors and windows of buildings. The see-through air filter developed using our approach has promising applications in terms of improving indoor air quality, and could be especially useful for countries experiencing haze or with high pollution levels. While increasing filtration efficiency will lead to a trade-off in air flow, the overall performance of our air filter is still better than commercial respirators. This novel invention is patent pending. Going forward, the team aims to add more functionalities, such as anti-bacterial properties, into the air filter. They also plan to commercialize this novel technology with the help of industry partners.